In 1915 C.N.A. Loos, an entrepreneur in the catering and hospitality sector, began a teahouse with stroll gardens next to his villa on Straatweg. After 1918 this villa served as the new municipal hall of the Hillegersberg district. In 1923 the landscaped park in the grounds behind the villa, along the waters of Bergse Achterplas, was opened to the public. 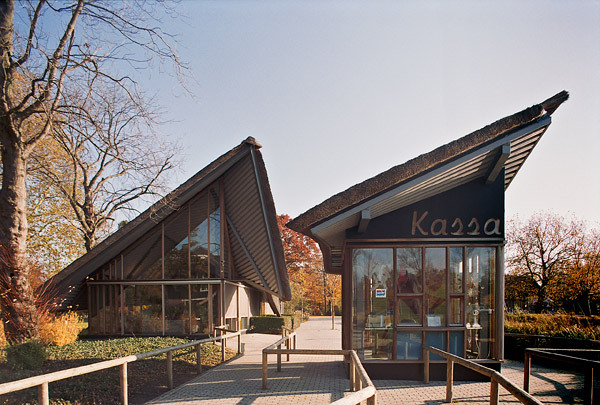 Plaswijck grew into a full-scale recreation park comprising a strolling park, a small zoo, a maze, a steel observation tower erected in 1933 and a service offering boat trips round the lake. A formal garden and rose garden complete the picture. The park has been enlarged on several occasions. During the renovation of Plaswijck Park to celebrate its first 75 years, the main entrance was moved from its discreet location on C.N.A. Looslaan to Ringdijk on the opposite side where school buses can park or briefly stop without hindrance. A spectacular bridge gets visiting groups safely across the road. Two elongated pavilions near the new entrance house all the necessary amenities including a restaurant, toilets, offices and a small shop. Erected in a transparent membrane of steel and glass to avoid intruding unduly on the park's ambience, their thatched roofs add an element of snugness.